Niroshan Dickwella would have considered himself rather unfortunate to find himself on the outside looking in after Sri Lanka’s Asia Cup squad was announced this past weekend, however a finger injury to Dinesh Chandimal might offer the 25 year-old an unexpected lifeline. The aggressive left-hander had been among Sri Lanka’s top three performers with the bat in the recent home series against South Africa series – only Kusal Perera and Angelo Mathews performed better – having scored 158 runs at an average of 31.60 and a strike rate of 82.72 at the top of the order. With Sri Lanka having struggled to find consistent opening batsmen over recent years, one would think that a player performing at such a level against one of world cricket’s most vaunted pace attacks would be a shoe-in - if not in the starting XI, then at least in the touring squad. Yet despite these performances Dickwella found himself on the outs yet again, when he was dropped for the one-off T20 against the Proteas, replaced by Chandimal who was returning from suspension. This has been somewhat of a theme in the Trinitian’s career so far where, despite having scored 1232 runs at an average of 32.42 and a strike rate of 90.45 in ODIs, he has failed to nail down a national team spot. The latest snub follows a poor showing in the recently concluded domestic T20 tournament where he scored just 24 runs across four innings, and the selectors duly cited inconsistency as reason for his omission - a claim which certainly warrants a closer look at Dickwella’s international career. Having made his T20I debut in early 2016 on a tour of India, an ignominious couple of outings saw him omitted for the ensuing Asia Cup in Bangladesh and World T20 in India. Dickwella would also miss Sri Lanka’s tour of England, as well as the home series against Australia, before eventually getting another chance as part of an inexperienced touring party to Zimbabwe. It was there that the brash left-hander took his opportunity with both hands, scoring 179 runs at an average of 44.75 across four ODI innings. Dickwella would take this form to neighbouring South Africa as well, where in five ODIs he top scored for the visitors with 197 runs at 39.40. He added to this in the T20 leg, scoring 133 runs across three matches at 44.33 and a strike rate of 156.47, as Sri Lanka secured a first series win in South Africa. A further 121 runs at 40.33 in the ICC Champions Trophy in England and 266 runs against Zimbabwe at home at 53.20 – including a career high score of 116 – would seemingly have earned Dickwella a longer rope than most. However, following an assured 74-ball 64 against India at home in August 2017, Dickwella suffered a lean stretch in which he would score just 243 runs across his next 15 ODIs - a run that would eventually see him dropped for the Nidahas Trophy earlier this year. 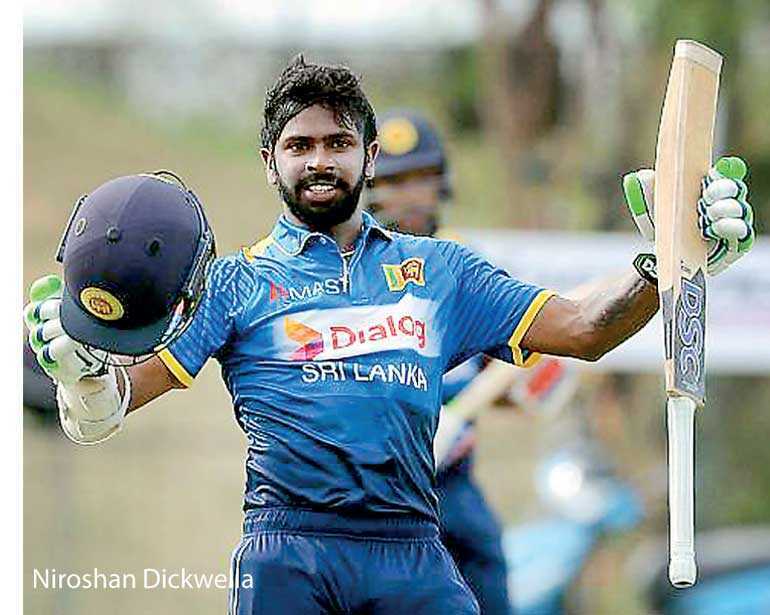 While a rejuvenated Dickwella would emerge a few months later as one of Sri Lanka’s star batsmen in the home series against South Africa, his omission from the subsequent one-off T20 and Asia Cup speaks more towards his subpar T20 record. With a high score of 68 his only score above 50, Dickwella’s average stands at 20.75 across 12 T20I innings – not far below his overall T20 career average of 22.21. While his ODI record, especially during a volatile time in Sri Lankan cricket, is somewhat beyond reproach, in T20s we are yet to see the real Dickwella. However in scenario when he was seemingly set to be overlooked in the shortest format yet again, the young man from Kandy has been offered an unlikely reprieve. The extent of Chandimal’s injury, a hairline fracture to his right middle finger, will become clearer in the coming week. If it were to rule him out of the Asia Cup, Dickwella seems to finally be in prime position to give Sri Lankan cricket the top order solution they’ve been so craving. Akila Dananjaya is set to miss at least the first two games of the Asia Cup, as the spinner will only link up with the rest of the Sri Lanka squad following the birth of his first child. Sri Lanka will face Bangladesh in the tournament curtain-raiser on 15 September, with their next game set for 17 September against Afghanistan. The absence of Dananjaya is a particularly bitter blow, with the spinner among Sri Lanka’s main attacking threats in the shorter formats of the game, having also regularly taken up new ball duties in the crucial powerplay period. With the top two teams from each group of three making it through to the Super Four stage, the truncated nature of the tournament leaves little margin for error and Sri Lanka will be hoping the offspin of Dilruwan Perera and the return of Lasith Malinga will help offset Dananjaya’s unavailability.